Why I chose this book: This book was given to me earlier this month as an author requested review. I am slowly coming to enjoy paranormal romance books and the synopsis of this book looked appealing. A magical school in a small town is a perfect setting for a supernatural thriller. I will warn you, I did not finish this book. I read about 200 pages and then had to stop. Why? Check out my review below. 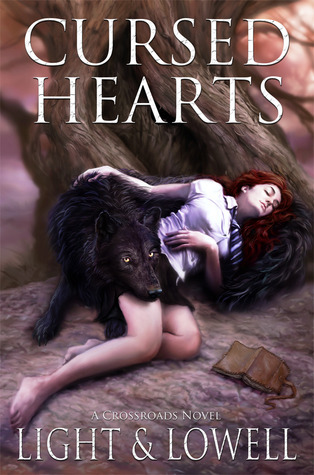 Cursed Hearts, A Crossroads Novel – the first book in what will no doubt prove to be an epic series. It’s a witty, supernatural page-turner that will keep you guessing. And the read is much like walking down a deserted street on a dark, misty morning – spine-chillingly beautiful. ...Rarely when we’re down does the world offer us a hand up instead of a sharp kick to the ribs. But when Rome Navarro, a penniless kid with home issues, receives a scholarship to a prestigious school in his hometown, life is starting to look suspiciously hopeful. Little does he know, Vardel Academy houses an old, deeply guarded secret, and Redwood Bay is harboring mysteries of its own that are just as unsettling. Things become stranger still when he learns of a curse that his family is supposedly plagued by. A curse that involves the shy redhead he has his sights set on. Throw in a guy with an unhealthy fascination for him, and a love rival with cruel intentions, and you’re left with a recipe for both a devilish good time, and inevitably, disaster.